David J. Fleishman graduated from Washington University in Saint Louis, receiving a Bachelor of Arts in Political Science, with honors. In 2012, Mr. Fleishman received his Juris Doctor with a Certificate in Advocacy from University of the Pacific, McGeorge School of Law. He became a member of the State Bar of California in 2013. At McGeorge School of Law, Mr. Fleishman received the Anthony M. Kennedy Fellowship and graduated as a member of the dean’s list. While in law school, he advocated on behalf of crime victims who could not afford representation as a member of the Victims of Crime Legal Clinic. He interned in the legal affairs division of the California governor’s office and served as associate articles editor on the McGeorge Global Business and Development Law Journal. Mr. Fleishman was also a teacher’s assistant for the courses Global Lawyering Skills I and Principles of Agency. Mr. Fleishman began his workers’ compensation defense career in 2013, working for a defense firm in Long Beach, California. David joined Dietz, Gilmor & Chazen in 2016 as an associate attorney, handling workers’ compensation defense matters. 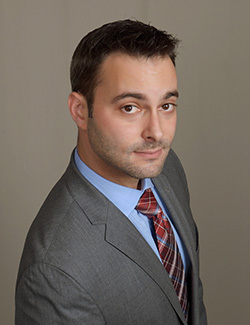 Prior to joining DGC Attorneys, David worked as a mediator in family law and corporate law. When he is not working, David plays softball and flag football, roots for his hometown L.A. Dodgers, reads Stephen King novels, and travels.